There are festivals in the world where there is a substantial programme put on with free admission – Montreal, Copenhagen and London are amongst the major ones which come to mind. But Salzburg may be the only festival which has an international line-up with artists of the calibre of Bill Frisell, Uri Caine and Marius Neset performing in some prestigious venues... where everything is put on without an admission charge. We have asked this question on Twitter and nobody has yet put forward another candidate. 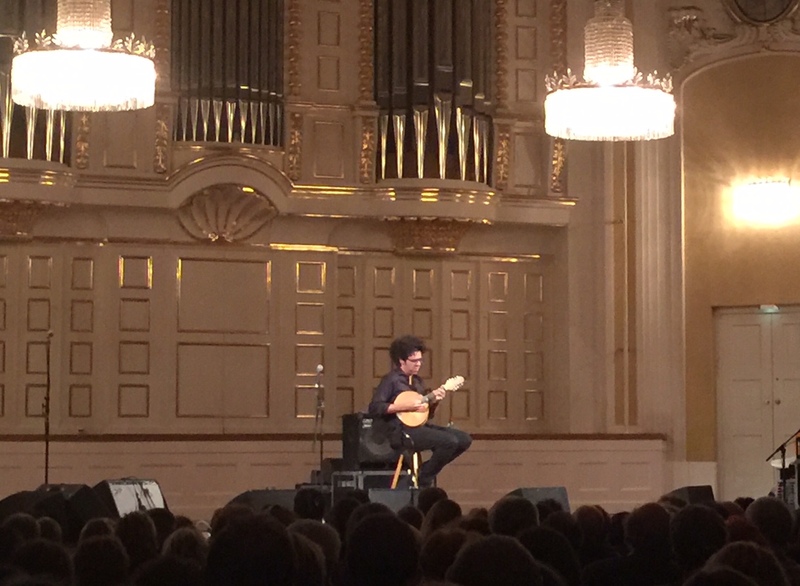 So here is my account of the 16 (out of 120) gigs that I heard or sampled at the seventeenth Jazz & the City Festival in Salzburg*. It has been the first under the artistic direction of Tina Heine, who founded Elbjazz. She suggested the initiative to stop ticketing – and it seems to have worked. Uri Caine Trio (Friday) – a remarkable free-form hour, a super gig covered in a single gig review HERE. Ulrich Drechsler with Stefano Battaglia and guest Sahar Lotfi. This was in the lovely Kavernen 1595 venue. Ulrich Drechsler plays bass clarinet and basset horn (Selmers, with wooden Backun bells for the gear-obsessed) and the repertoire was mainly from a recent duo album with Stefano Battaglia of Little Peace Lullabies. Battaglia is wonderful at holding a line at very slow tempos. A nice melodic, quiet, intimate gig, with a guest appearance by a remarkable Sufi vocalist Sahar Lotfi with incredible natural overtones. There is good video of the three of them from last year which gives a good flavour of their quietly meditative slow-burn style HERE. Bill Frisell Quartet – this was his new films project with a stellar line-up of Thomas Morgan on bass and Rudy Royston on drums, with occasional songs from Petra Haden (daughter of the late Charlie). For me it was too uniformly ponderous and I couldn't get into their slow-mo version of Bacharach's Alfie at all. Doro Hanke and Robert Friedl (Wednesday) - covered in opening night round-up HERE. Hamilton de Holanda (Saturday) – a genuine highlight. Solo mandolin captivating a full crowd in an 800-seater concert hall needs an exceptionally communicative musician, and HdH did it with room to spare. I kept on thinking of the difference with ukelele virtuoso Jake Shimabukuro, whom I heard recently, and it is this: with Hamilton de Holanda, there is never just virtuosity for its own sake. He can play at illegal speeds, but absolutely everything is expressive. Das Kapital (Saturday) – this trio, led by saxophonist Daniel Erdmann, was placed in the right location. An exhibition of agitprop drawings and prints in the Rupertinum modern art gallery. This trio’s repertoire of Hanns Eisler propaganda music fitted the location. They were playing in a packed, small gallery, but the sounds were going round the building – so I wandered around the gallery, taking in political art from Honoré Daumier to Georg Grosz and Frans Masereel while listening. Omer Klein Trio (Thursday) – a popular and successful group, with catchy, hooky tunes, and the audience loved it. The trio have just moved label and will put out their next album on Warner. Libertango (Saturday). Libertango proved to be a lively street band and were very lucky with the weather on Saturday. Salzburg can often produce what is locally called Schnürlregen (rain in the form of little strings) but on a glorious sunny Saturday, they livened up the popular Linzergasse – where the real Salzburger go to shop. Matthias Loibner (Saturday). Loibner has made the sound world of the hurdy-gurdy or Drehorgel his lifetime’s work and he drew a rapt audience, in the Weinek antiquarian bookshop, into his world of charm. He has also recorded a mesmeric, recommendable, left-field complete Schubert Winterreise with the Serbian singer Nataša Mirković. Loktor (Wednesday) – covered in opening night round-up HERE. Marja Nuut (Saturday). Nuut was playing in the lovely basement Weinarchiv venue underneath the Blauer Gans Hotel. She invites the listener into a particular personal world. Her musical universe is that of Veijo Tormis and the swing songs of Estonia. and it is a rich seam. She also tells delightful and often cruel stories. On this site, both Henning Bolte and Naoise Murphy have reviewed her for us; both have been captivated by what she does – and it is not difficult to see why. At the gig I went to, the spell got broken. People really need to stay seated and let these narratives unfurl. Once one person has decided in the middle of a number that there might be a better gig somewhere else, and then someone else has instantly swooped in and grabbed the empty seat, the magic has gone. Orchestre National de Jazz (Wednesday) – covered in opening night round-up HERE. Diknu Schneeberger Trio (Wednesday) – covered in opening night round-up HERE. Ian Shaw and Trio (Wednesday) – overed in opening night round-up HERE. Nils Wogram and Bojan Z (Thursday). Just as the St. Andräkirche was the right venue for Peter Evans, the long echo – I just heard their rehearsal/soundcheck, so I probably shouldn't be writing – was a real challenge/struggle for this fine and communicative trombone and piano duo. I want to hear them again. *My hotel room was provided by Jazz & the City Altstadt Marketing. I am also doing a Jazz Travels feature for JazzFM – link to follow.